Have you ever wanted to read the Bible in a year and failed? I did many times until I learned a few simple strategies that catapulted me over the most common mistakes. In today’s podcast I cover those mistakes and reveal the solutions that will prevent you from making them. This all adds up to you reading the entire Bible in one year spending fifteen minutes or less a day reading. The strategies are ones that I’ve used myself as well as many others to successfully read the Bible in a year. While reading the Bible in a year is a worthy goal, I hope ultimately this pursuit will create in your life a daily discipline of reading. A daily discipline will result in you effortlessly reading the Bible dozens of times. One of the most important success secrets covered in the podcast is you need a daily reading plan. You need a plan that is reasonable and strategic. I’ve taken the guesswork for you out of knowing what your bible reading plan should look like. 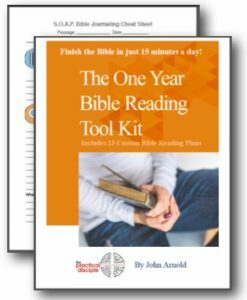 I’ve put together for you The Practical Disciple One Year Bible Reading Toolkit that contains links to thirteen different bible reading plans. I’ve included one through the Bible in a year plan that I designed myself. My plan starts with easy and engaging books of the Bible first, so you can establish a solid discipline before getting into difficult books. Plus, this plan breaks up the Psalms into doable sections over the course of the year to prevent burn out. Lastly, I’ve spread out the reading of the four gospels so you are brought back to the story of Jesus’ life repeatedly. As I said, these strategies have worked for me as well as other. I know they can work for you even if you have tried and failed in the past. Failing was likely not your fault. No one probably ever armed you with a strategic process for success. Well, this is it. Follow the step-by-step instructions in the One Year Bible Reading Tool Kit and today’s podcast and one year from now you will get to say, “I did it. I read the entire Bible in 2018.